Cleaning ProcedureRemove any old thread sealant, gasket material or sealantusingEN 28410remover.Clean all cylinder head surfaces withnon-corrosive solvent. 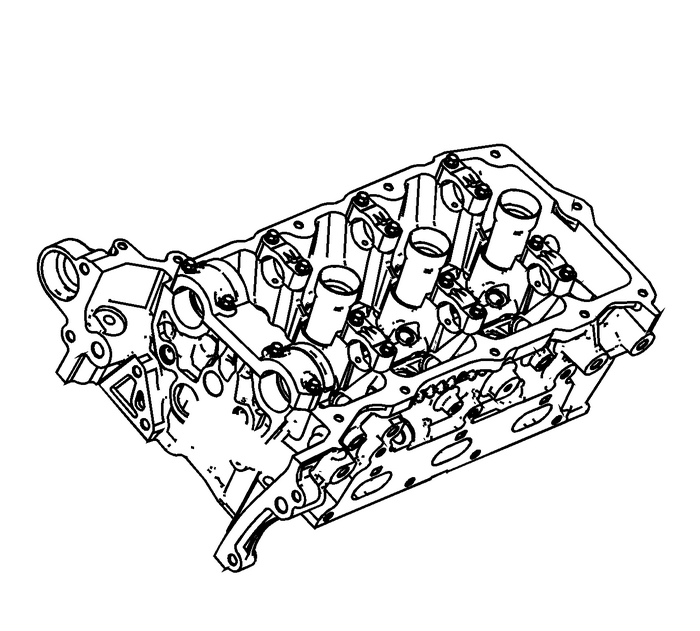 Inspect the cylinder head camshaft bearing surfaces for thefollowing conditions:Excessive scoring or pittingDiscoloration from overheatingDeformation from excessive wearIf the camshaft bearing journals appear to be scored ordamaged, you must replace the cylinder head. DO NOT machine thecamshaft bearing journals.If any of the above conditions exist on the camshaft bearingsurfaces, replace the cylinder head.Inspect the cylinder head for the following:Cracks, damage or pitting in the combustion chambersDebris in the oil galleries — Continue to clean thegalleries until all debris is removed.Coolant leaks or damage to the deck face sealing surface— If coolant leaks are present, measure the surfacewarpage as described under Cylinder Head Measurement –Deck Flatness Inspection.Burrs or any defects that would degrade the sealing of theNEW secondary camshaft drive chain tensioner gasketDamage to any gasket surfacesDamage to any threaded bolt holesBurnt or eroded areas in the combustion chamberCracks in the exhaust ports and combustion chambersExternal cracks in the water passagesRestrictions in the intake or exhaust passagesRestrictions in the cooling system passagesRusted, damaged or leaking core plugsIf the cylinder head is cracked or damaged, it must bereplaced. 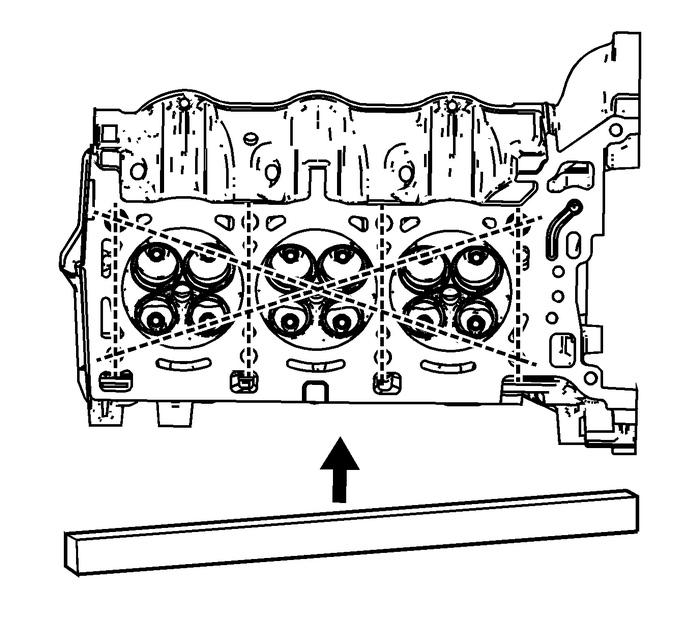 No welding or patching of the cylinder head isrecommended. Inspect the camshaft position actuator oil feed check valves.Damaged, restricted or clogged check valves must be replaced. RefertoCylinder Head Disassemble. 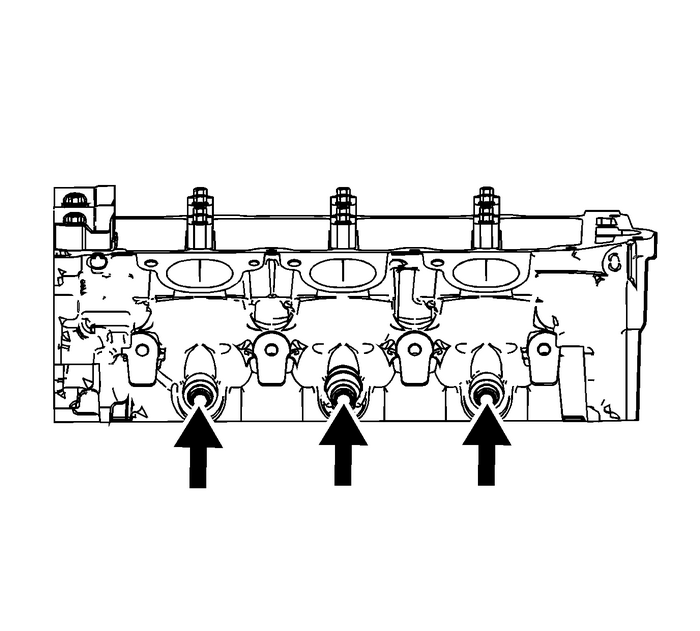 Inspect the fuel rail injector bores and clean withEN-47909kit, if required.Cylinder Head MeasurementCamshaft Journal ClearanceInstall the camshaft bearing cap in the cylinder head withoutthe camshaft. Measure the valvestem-(1)-to-guide-(2)clearance. Excessive valve stem-to-guideclearance may cause an excessive oil consumption and may also causea valve to break. 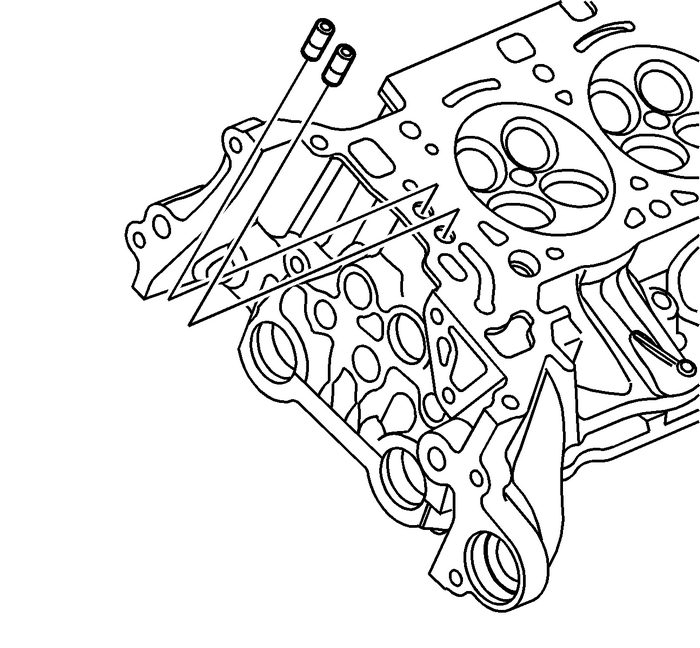 Insufficient clearance will result in noisy andsticky functioning of the valve and will disturb the engineassembly smoothness.Clamp theGE 8001setto the cylinder head at the camshaft cover rail.Locate the dial indicator so that the movement of the valvestem from side to side, crossways to the cylinder head, will causea direct movement of the indicator stem. 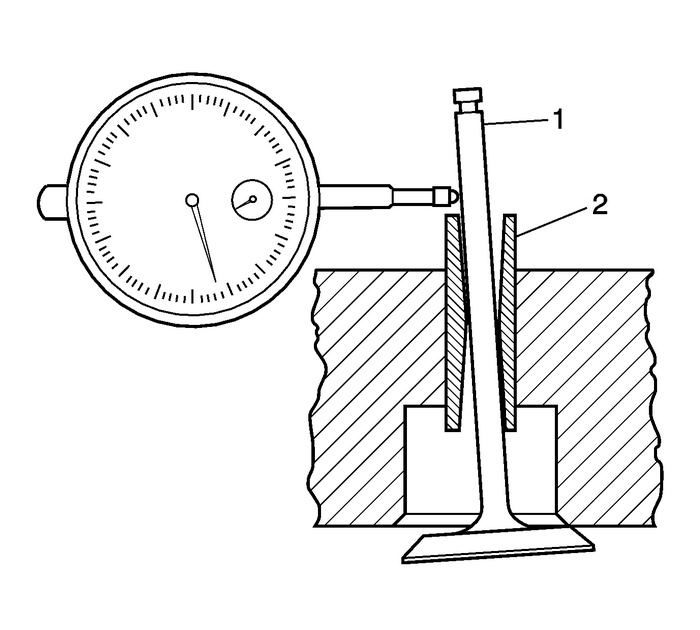 The dial indicator stemmust contact the side of the valve stem just above the valveguide.Drop the valve head about 0.064-mm(0.0025-in) off the valve seat.Use light pressure when moving the valve stem from side toside in order to obtain a clearance reading. Refer toEngine Mechanical Specificationsfor proper clearance.If the clearance for the valve is greater than specificationsand a new standard diameter valve stem will not bring the clearancewithin specifications, the valve guide may be oversized by0.075-mm (0.003-in) using theEN 42096reamer. There is 1-size of oversized valve stemavailable for service.Valve guide wear at the bottom 10-mm(0.390-in) of the valve guide is not significant tonormal operation.If oversizing the guide does not bring the clearance withinspecifications, replace the cylinder head.